After many years of mistakes and some dead plants, I have finally grown a green thumb. I’ve been really lucky with a great herb garden but this year I’ve decided to try my hand at some new edibles. My rainbow swiss chard and leeks are growing like mad so the chard was my first harvest. Preparing organic, fresher than fresh and inexpensive vegetables from my backyard was pretty damn satisfying. And tasty. This vegetarian recipe is from The Food Network magazine. I made a few modifications and additions – but was really impressed with the hearty flavors overall. Position a rack in the upper third of the oven and preheat to 350. Toss the tomatoes, garlic, balsamic, olive oil and 1/4 teaspoon salt in a large ovenproof skillet. Roast in the oven until the tomatoes are charred around the edges, about 25 minutes. Reduce the oven temperature to 300 but keep the tomatoes inside. Meanwhile, bring 5 cups water to a boil in a saucepan over medium heat. 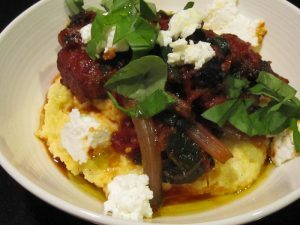 Slowly whisk in the polenta until smooth and creamy. Add 1 teaspoon salt, and pepper to taste and the cream. Stir to combine. Remove from the heat, cover and keep warm. This looks amaaazing. Remind me to send you a Marta recipe for light Italian wedding soup with swiss chard. Your blog is going to be my lunchtime distraction!